Essential natural elements are those that are rich in nutrients. They have been formed in the trees and flowers, in the depths of the sea, and in the layers of the earth. PUT ON MAGIC ionizes these elements into a fine mist so that they may better spread to each and every cell of your skin. We hope you will try it and see how your own skin can become revitalized. We’ve also included zeolite to cleanse your body of the toxins that accumulate as a result of our modern lifestyle. Together, it will revitalize your hair and skin and restore their youthful vigor. 3. Open your aura with flower power! Peony extract, which gives it richness and body; roman chamomile flower extract, which gives it moisture and gloss; white nettle flower extract, which keeps it smooth; small-leaved lime flower extract, which has a high moisturizing affinity; and many other naturally derived essential elements! When you try this mist, imagine that you’re casting a spell to endow yourself with the beauty and pride of a flower! We have mixed up lots of sweet delicious fruit scents, including strawberries, cranberries, blueberries, and raspberries, in order to bring out the young child inside you. For someone like me who had been working with hair for a long time, it was like a revelation. Our hair and bodies are just like plants. They’re all made up of living, breathing cells. I’m grateful to the earth. So as a sign of that gratitude, I’ve made sure that the words “Thank you” are inscribed at the bottom of every bottle, in every language used around the world. As this manufacturing process takes more time than most, I’m afraid I may have to ask you to be a little patient. 1. Spray PUT ON MAGIC all over your face, then gently rub it in, following the direction of the arrows. Three times! Quickly! If applying on top of your makeup, you can apply it lightly. 2. Rub it in quickly starting from behind your ears and moving down to your chin and neck following the direction of the arrows. Quickly! Firmly! Repeat three times. 3. Next, trace up and down quickly from your shoulders to your collarbone following the direction of the arrows. Quickly! Firmly! Repeat three times. 4. Press inward, beginning from outside your clavicle and going to its center. If you spray your chest it will help keep your skin taut. Apply generous amounts of PUT ON MAGIC to cotton and pack it for 5 minutes. Next, use it together with your favorite beauty cream. Gently spray PUT ON MAGIC on your face. The more you spray, the more tissues and paper you'll need to keep the liquid in check (and to reduce friction). Let it mix with the foundation on your sponge or puff (do not add any more foundation). Finish by applying face powder or foundation. After drying off with a towel, spray it on 10 different locations on your scalp. After drying off with a towel, spray it generously on your hair. Comb your hair well, and it will give it richness and body. 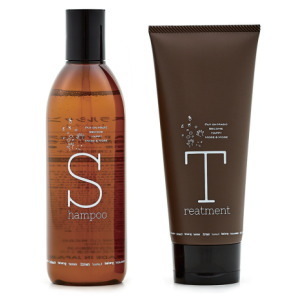 It will help your hair retain moisture and oil, giving it shine and gloss. 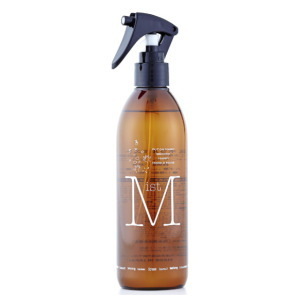 Wet your dry hair with PUT ON MAGIC MIST. Dry it with a hair dryer. Fulvic acid chelates (combines) essential nutrients inside our bodies and boosts absorption It’s also believed to help fight bacteria, act as an antioxidant, prevent cancer and strokes, and keep your arteries from hardening. It fights bacteria, acts as an anti-inflammatory agent and anti-oxidant, prevents wrinkles and other aging effects, and eliminates allergens. Gives hair richness and body. Improves blood flow and skin metabolism. Grows hair, prevents dandruff, and gives hair a rich shine. Has astringent, anti-inflammatory, and hematic effects, and prevents rough, dry skin. Anti-inflammatory, hair-loss prevention, circulation stimulation. Helps a variety of cellular and metabolism-related functions that make up the skin’s structure to work better. An ingredient commonly used in medicinal hair tonics. While we expect the product’s quality to last, we do recommend that it be used up quickly for highest potency. Please avoid storing it in hot or damp locations. If you experience any adverse effects, please stop using it. Due to the product’s moisturizing ingredients, the spray nozzle may occasionally become jammed. Please be sure to use the included spray cap when using the product. As this product uses rare fulvic acid, all shipments are exclusively made production-to-order. As a result, you may need to be patient until the product arrives.